The July 14th parade on the Champs-Élysées saw a dynamic demonstration in front of the presidential grandstands of the French Army’s future connected armoured vehicle, otherwise known as the Multi-role Armoured Vehicle (VBMR). 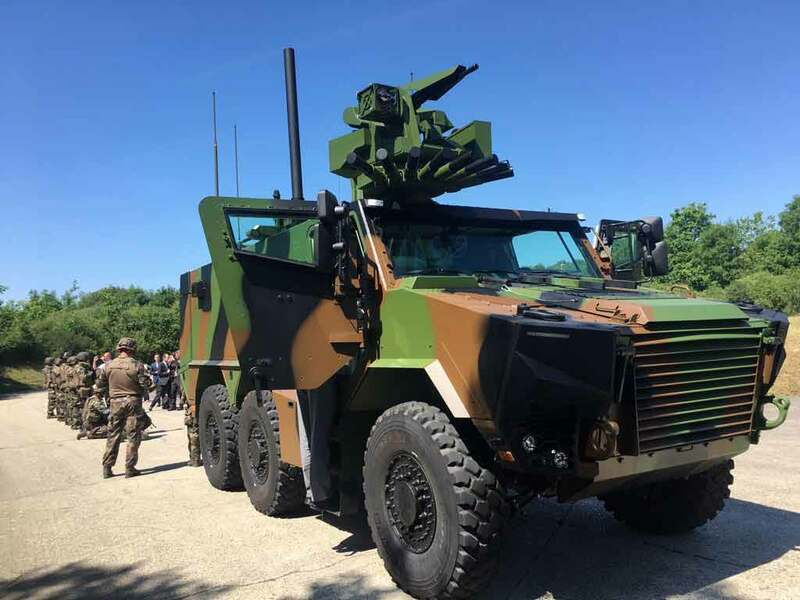 The VBMR “Griffon” will succeed the VAB (Véhicules de l’Avant Blindé), which was manufactured in the 1970s and 1980s and used intensively by the French Army in all theatres of operation for the last 30 years. The VBMR is an “info-enhanced” vehicle interconnected in real time to other vehicles thus providing new operational and collaborative combat capabilities. The 6x6 Griffon weighs approximately 25 tonnes and is equipped with a remotely-controlled weapons station. It will exist in several versions (troop transport, command post, artillery spotter and medical evacuation). This first dynamic demonstration of the VBMR, whose development, manufacture and vehicle support contract was awarded by the French Defence Procurement Agency (DGA) in December 2014, reflects the concrete advances of the Scorpion programme. It demonstrates compliance with the development and industrialisation schedules with the first deliveries of the VBMR scheduled for the end of 2018. It is also the result of a beneficial and efficient collaboration between Nexter, Renault Trucks Defense and Thales, united in a temporary joint venture, and their service providers and partners, co-ordinated by DGA on behalf of the French Army. The first production order placed by the DGA was for 319 Griffon vehicles. The Scorpion programme provides for the delivery by the temporary business grouping of 1,722 Griffon vehicles and 248 Jaguar engines to the French Army, as well as the associated logistic support facilities. In June this year, the Belgian Army announced plans to acquire 60 "Jaguar" and 417 Griffon vehicles for €1.1 billion.